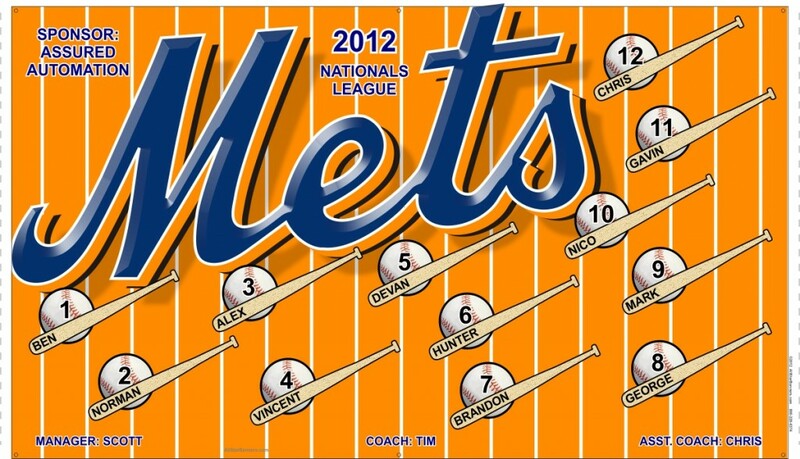 Assured Automation would like to congratulate the Mets on their first win of the season, 12-0! Keep up the great work! The weather has been killing us. The boys do not play well in the cold/damp/rain/overcast weather as our record now shows with our last two games loses. Mets now have a record of 5-2-1(tie). Let us all pray for some SUN. As of 5/17/12 the Mets record 7-3-1(tie) We are in 3rd place in the league. Our next game is Monday at 6:00 pm Toomer Field. We had a game last night (5/31/12) against the Phillies. We won with a score of 14-0, the boys were on fire last night. We are now in 2nd place. The regular season has ended, with a record of 8-4-1 ( we had 4 rainouts ) And came in second place. The playoffs start this week, wish us luck. Our season is done !! We lost in the playoffs 0-5 against the Dodgers. Thank You Assured Automation for your sponsorship.